Student nurses and midwives are set for a pay increase from the 1st of March, under a new deal agreed by the Government and the nursing unions. As part of their undergraduate degree, student nurses are expected to complete 36 weeks of placement over the course of their fourth year. Since 2013, the hourly rate of pay for these students was dropped to renumeration between €6.86 and €8.24 – all of which are below minimum wage. 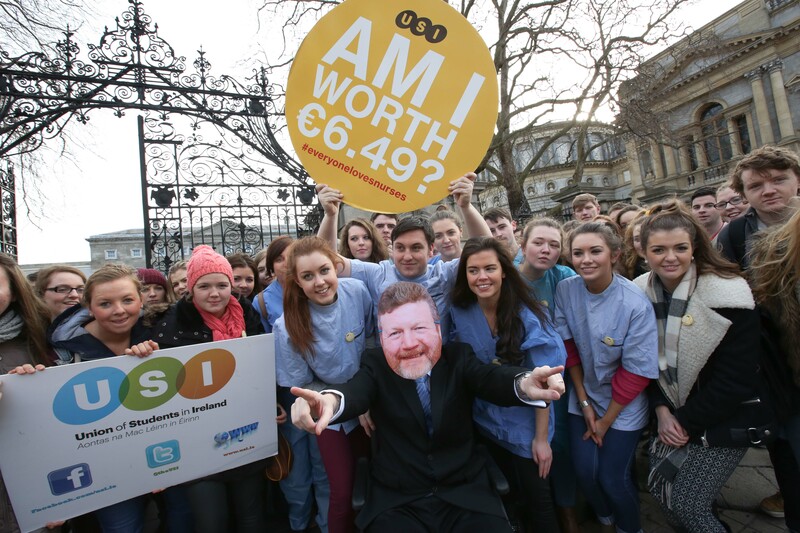 The new arrangement will see students being paid €9.48 an hour for the entire placement. This means that students will now receive 70 per cent of the staff nurses incremental pay scale, the Irish Nurse and Midwives Association (INMO) announced on Monday. Secretary general of the INMO Liam Doran, said that a “wrong done to them (student nurses) four years ago has been partially corrected”. The Union of Students in Ireland (USI) have welcomed the proposals that will come into effect at the beginning of March. “I read about one nursing student who was paid just €374 after tax for working 114 hours in three weeks, which equates to a mere €3.28 an hour. This change in the wage increase means that student nurses and midwives a more secure financial position,” Kevin Donoghue, USI President, said. A recent study by the USI found that 93 per cent of Irish student nurses have considered emigrating after they receive their degree. This is due to the poor pay conditions offered in Ireland in their field of work. “We feel this news has taken frustration away from us student nurses as similar effort and work is being done by interns as by staff nurses. Even if it is just 70 per cent, it is certainly a step in the right direction”, DCU student nurse Una Galligan, told The College View. The cost of implementing the student nurses’ pay increase in 2016 is approximately €3.5 million.